Not too long ago when perusing the internet I came across something called the Fantasy Ohio Beer League which pitted beers from 32 different Ohio breweries against each other in a contest hosted by Cincinnati based Ohio Beercast. Somewhat to my surprise the winner was a beer that I was unfamiliar with, Fork in the Road, by Blank Slate Brewing in Cincinnati. It beat out a lot of beers that I hold in high regard. So when I saw that The Ohio Tap Room in Grandview had this beer on tap, I was there the next day to pick up a half-growler. First a little about Blank Slate Brewing since it was my first exposure to the brewery and those outside of Cincinnati may not be familiar with them. They were founded in March 2011 and are located on the east side of Cincinnati. At the present time they do not have a tasting room. To the best of my knowledge their beers are only available on draft. 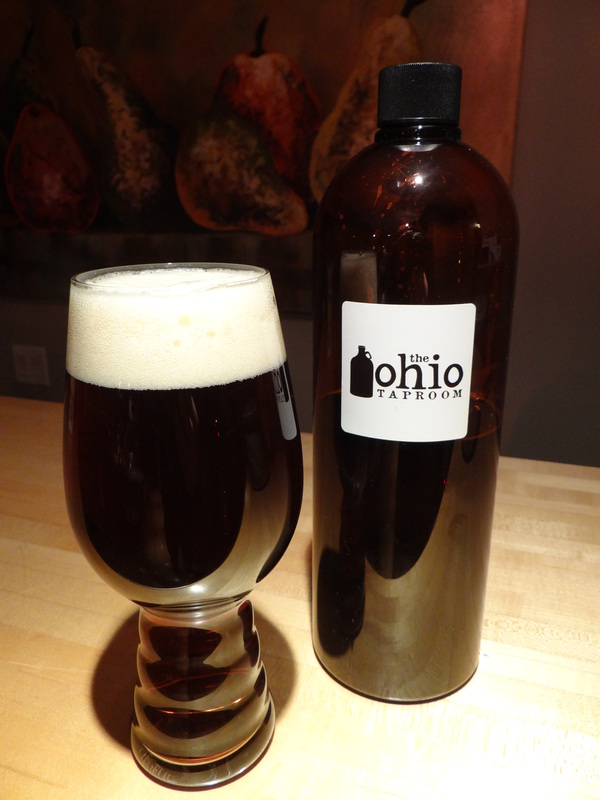 In Columbus your best bet is probably the Ohio Tap Room, but other growler shops are also a possibility. Fork in the Road has a deep walnut brown color. The dark color makes it hard to see through but if you hold it up to the light you can see that it is actually quite clear with very little haze. The darker colors come from the use of Munich and CaraRed malts. It settles into the glass with 1-2 fingers of off-white head. It’s an aromatic beer with a big grapefruit nose, reminiscent of a Columbus IPA. According to the Blank Slate website the hops used are Citra and Centennial, which would explain the lovely citrus aroma of this beer. Coming to the taste, the roasted malts initially hold their own, and for the briefest moment you can discern a hint of chocolate. Then bitterness from the hops washes over your tongue leaving behind a bitter grapefruit/pine finish that lingers for quite some time. The mouthfeel starts smooth and creamy but once the hops emerge it becomes dry and fairly bitter. Fork in the Road has the hop profile of a first class IPA with dark roasted malts that remind me of an English brown ale. In that regard it is similar, but in my opinion superior to Zoe by Maine Beer Company (a beer I reviewed last month). I finished the half-growler over two days and interestingly I preferred it on the second night. The bitterness, which was initially was a bit more than I would like, seemed to mellow a little restoring the balance at the finish. Is it the best beer made in Ohio, as the results of the Fantasy Ohio Beer League results would suggest? Obviously that depends on your tastes, but I wouldn’t go quite that far. In terms of hop-forward Ohio beers I still prefer beers like Bodhi, White Rajah and Chillwave over Fork in the Road. Having said that, it is a quality beer with a very different malt profile than all of those beers. For a black IPA I would say it is one of the best around. If you are a hophead and you haven’t tried Fork in the Road you owe it to yourself to seek this beer out. It is a seasonal. Scott (the BlankSlate Yeast Farmer) will swap this out with his “Lesser Path” when he switches seasons…another great beer to try if you like “the Fork in the Road (which I actually have on tap in my house!) You can read a review of Lesser Path at http://www.cincinnatibeer.org. Fork in the Road is a great beer by a great brewer here in Cincinnati!. Thanks for the information about the availability of the Blank Slate beers. Changing your beers with the seasons is a cool concept. I’ll look forward to trying more Blank Slate beers in the future. I’m also glad to hear that I’ll have a few more chances at Fork in the Road before it rotates out. Fork In The Road is my favorite Blank Slate beer and one of my favorite Cincinnati beers. The whole India Amber Ale or Red IPA flavor profile is very appealing to me. Glad to hear they’re making it that far north! It was quite a good beer. Smells and finishes like an IPA, but more complex in between. Compared to similar beers with a national profile I would say it was better than Zoe by Maine Beer Company, but not quite as good as Nugget Nectar by Troegs. Is it a seasonal, and if so when is it available? All of our beers are seasonal. We have no flagship or year round beers…at least for now. FitR is available from October through March.